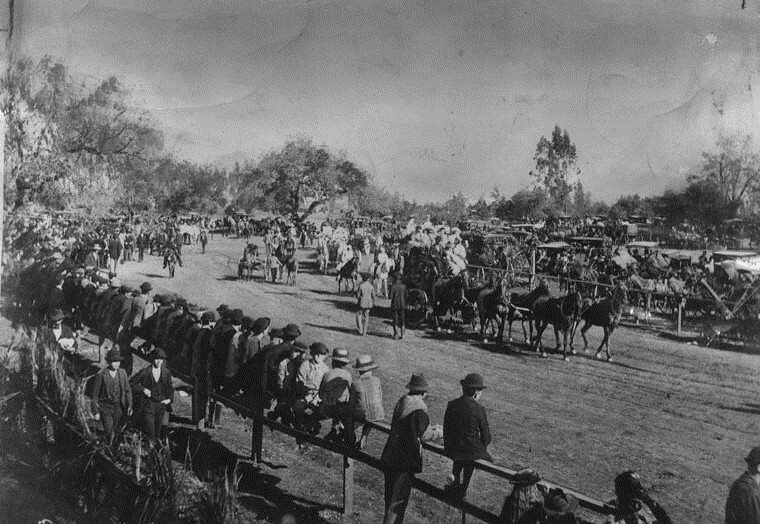 Photo of Rose Bowl, 1902. On January 1, 1902, the first ever Rose Bowl football game was played. Michigan took the victory over Stanford, 49-0, shutting out the prestigious team of celebrated athletes. It quickly became a time-honored New Years Day tradition, although not officially until some years later. A “Tournament of Roses” had been traditionally held on January the first from 1890 to 1901. But when Stanford’s, Walter Rose created the idea of playing for money, excitement also grew for a national coast to coast college football challenge thus, the Rose Bowl was born. Michigan was chosen to play the prestigious Stanford team which did not really seem to be a fair match. Michigan was undefeated in their league and Stanford had suffered upsets and a critical loss to California that year. The terrible loss suffered by Stanford caused sports financiers to rethink the value of the monetary earnings and subsequently it was decided to forfeit more games. Instead, traditional games of chariot races were re-instated until 1922 when the Rose Bowl was returned. Today the Rose Bowl, played in its original city, Pasadena, California, is still an honored tradition that fans world wide look forward to watching. It is seen as the culmination of a great college football year and a pre-cursor to the NFL’s Superbowl game. It is not only recognized for football but also for watching the parade and gathering together with friends and family in anticipation of making new memories and traditions.